ONE is the Māori word for soil/mud/earth. The place where life when touched by wai (water) is created. For this solo exhibition Mumu (Will) Moore has created 28 purerehua and porotiti (Taonga Pūoro, Māori instruments). Purerehua - is an instrument used for karakia (prayer, incantations), to connect from Papatūānuku (earth mother) to the Ngā Atua (many gods) that live/reside above the earth. They can be used to invoke rain, for spiritual practices. They can be worn on the body as a pendant. Porotiti - is a smaller instrument that is used for Rongoā Māori (Māori healing), its is played with two hands, and spins on itself to create a humming noise which vibrates through the cord to help with arthritis and also used to release the sinus’s and ease pain in the body. They can be worn on the body as pendant. The theme for this solo exhibition comes from the idea of the creation of life forms, in this case Mumu is working with rakau (trees), or more so the timber from these native Aotearoa (NZ) giants. The timber has been (koha) gifted by Todd O’Hagen from “fox and timber” a timber recycler here in Wellington, then shaped, sanded, carved and painted. The mauri of the maker (Mumu), the location where it is carved, and the rakau (timber) itself combine to create a unique mauri that is infused into the instrument. 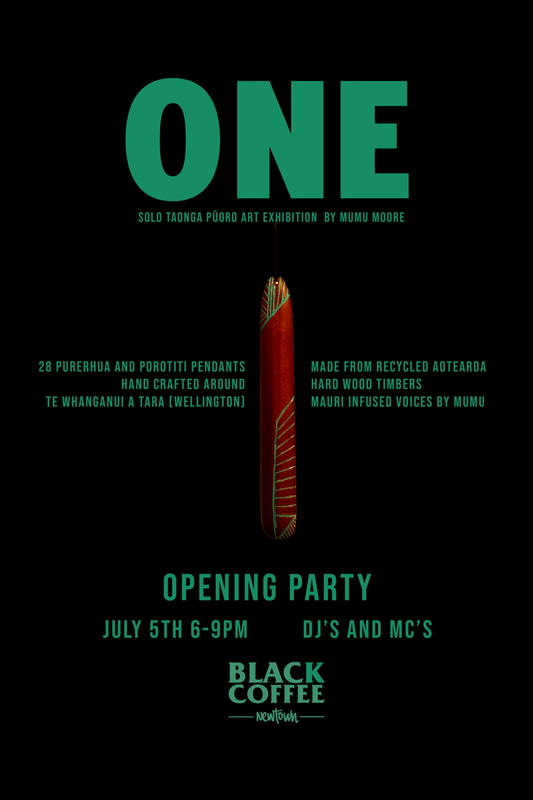 In this collection 28 pieces are being created throughout Matariki (Māori new years) with 4 elements and 7 per element. The four elements are Wai (water), One (earth), Āngi (air), Ahi (fire). Each element has 7 children. The children are created in locations around Te Whanganui a Tara (Wellington), and then given the Māori name for each location. I have been lucky enough to get my guidance on the original Māori place names for Wellington from my good friend Ben Ngaia. Purerehua and Porotiti range in prices from $160 - $350 depending on type of rakau (wood) and time to make each one. This exhibition is a black and white collection of experimental analogue street and portrait photography in Wellington. Boxmonks Photography has been captured on medium format, 35mm film and DSLR. All hand processed in a darkroom. Some of his images have been put through chemical abrasion, wire brushing, solarisation and reprinted with collodian up to 12 times to leave photograph that often reflects an honest personality of the subject. Don't miss this unique photography exhibition! Opens Thursday 7th June 6-9pm. Jade Weaver is a Wellington based Artist. Her work is inspired by the colourful imagination of nature and presents female characters in vivid dreamscapes. Often borrowing subjects from the pages of high fashion magazines she seeks to remove the highly stylised visual reproductions of the female form from the glossy pages and relocate them into fabricated natural environments. Giving them a world to inhabit, a name, and exploring the relationship between the female body, spirit and nature. The divisions merge so that the subject becomes the landscape and the landscape the subject. Jade has worked within the fashion industry for the past 20 years in varying roles and has a Bachelor of Design from Massey University. "In Other Words"; "A visually articulate and lyrical exploration of our local and pop colloquial; our slang, phrases, idioms, quotes, anograms and exclamations". A bold & unapologetic collection of visual works from a group of fiercely modern women. Exhibition opening night is Thursday 1st Feb starts 6pm, and is a licensed event! Come get rowdy with the ladies. Art work inspired by the band Bud Rot. Illustrations, screen prints, prints and original work. Exhibition running until the end of January 2018.